1. Tree evaluations can give some forewarning to structural problems or weaknesses that may result in tree failure (limbs or leaders breaking) or complete tree failure (the tree falling over). 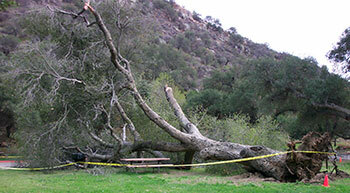 A Tree Risk Assessment can be a valuable part of an evaluation or the only reason for the evaluation. The split leaders (above) were the result of weak attachments because of acute branch angles and included bark of co‑dominante stems. Fortunately the failure only resultedMulti‑trunks can be attractive but are very weak. in minor property damage and no injuries. The result of this same defect can be seen on the multi-trunk melaleuca to the right. This failure landed on a car. Multi-trunks can be attractive but are very weak. An evaluation of the live oak (left) determined that there was extensive root decay. The crown had severe dieback and, duringthe winter, the area within the dripline had a large number of honey mushrooms (right). These honey mushrooms are the fruiting body of oak root fungus, Armillaria mellea. The tree was not removed and fell over. Fortunately, there were no injuries. By the time conks appear, the fungus has been decomposing t	he wood for years. Breaking off the conk or removing the mushrooms does nothing to stop the fungus. The majority of the fungus, the mycelium, is in the wood or cambium. Decay detection may help determine the extent of internal decay. 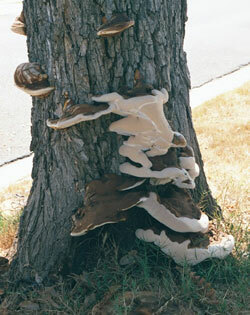 The conks of Ganoderma lucidum, a white rot (above) are a sign of decay inside the base of this trunk. This fungus kills the cambium as well as... white rot will lead to complete tree failure.rotting the wood. This will lead to complete tree failure. 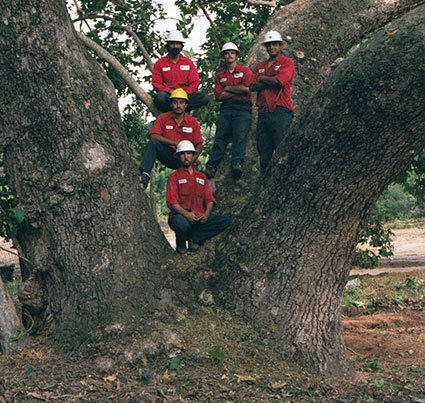 Look for a TRAQ (Tree Risk Assessment Qualification) certified person. This is a limited walk by, drive by or fly over, which does not necessarily entail a complete walk around a tree. This usually only includes the specific tree or trees that are being considered for the purpose of a proposal for work or risk assessment. This generally focuses on obvious defects, imminent or probable likelihood of failures and may not even classify as true “risk assessment” if there is no evaluation or analysis of the individual tree(s). There are generally no tools used at this level. This is the fastest and least thorough assessment. This is the standard or basic assessment in response to a client's request for tree risk assessment. This generally entails more time on the tree to include a walk around inspection. Simple tools such as probes, measuring devices, binoculars, mallet or magnifying glass or scope may be used. This typically does not include an aerial inspection (other than, possibly, a ground level inspection with binoculars) or below ground inspection. A Level 2 assessment is usually necessary for determining the need and scope of a Level 3 assessment. This is the most detailed and time consuming level of assessment. This level usually requires specialized equipment, data collection and analysis, as well as a higher level of expertise from the assessor. Some examples of specialized equipment are the Air‑Spade, Drone or the Resistograph. This may also involve sending samples to labs for analysis. The assessor should determine which methods are appropriate and/or the least invasive and discuss this with the client. As noted above, a Level 2 assessment is usually required to determine the need and scope of a Level 3, which will usually take place at a later time due to time requirements determined during a Level 2. All assessments, evaluations and technologies have limitations. Any evaluation of an individual tree is not an exact measure, but a qualified estimation. 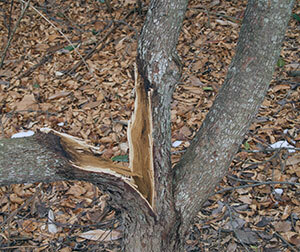 Arborists cannot detect every condition that could possibly lead to the structural failure of a tree. Trees are living organisms that fail in ways we do not fully understand. Conditions are often hidden within trees and below ground. Arborists cannot guarantee that a tree will be healthy or safe under all circumstances, or for a specified period of time. Likewise, remedial treatments, like any medicine, cannot be guaranteed. Trees can be managed, but they cannot be controlled. To live near trees is to accept some degree of risk. The only way to eliminate all risk associated with trees is to eliminate all trees. 2. An evaluation can also spot conditions causing tree stress. 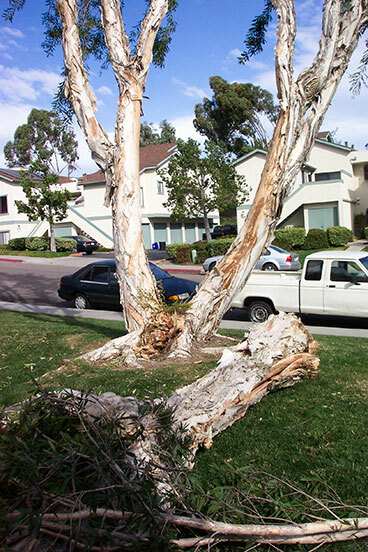 Stressed trees are more susceptible to deseases and insect attacks than are healthy trees. 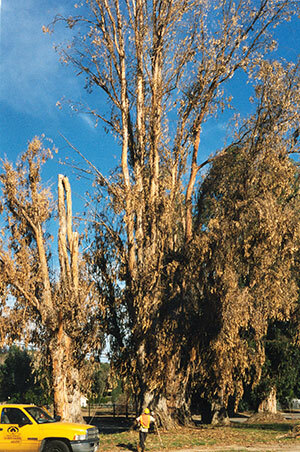 The blue gum eucalyptus (left), Eucalyptus globulus, were killed by the eucalyptus long‑horned beetle. The beetle is a secondary infestation and (in the blue gum's natural habitat) a natural weeding agent of stressed and unhealthy trees....larvae destroy the tree's ability to transport water resulting in death. The trees were stressed after years of drought and no supplemental irrigation. 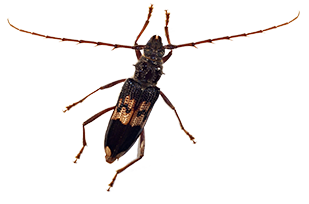 The beetles are able to enter the cambium area of the tree where the larvae destroy the tree's ability to transport water resulting in death. 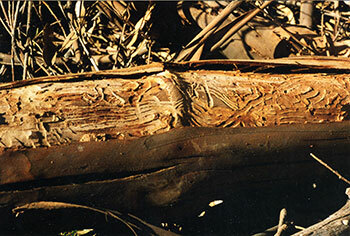 Above are the channels the feeding larvae create under the bark. This is what is left of the tree's vascular bundle. There are different bark beetles for different genus of trees, but the result is the same and the primary cause is stress. 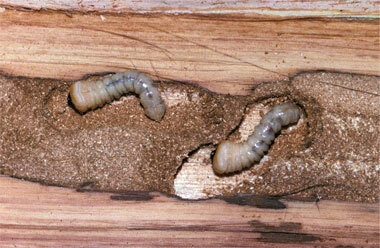 Pictured below are larvae embedded in wood. 3. An evaluation is also invaluable in protecting the health and future of specimen trees and recommending proper care & maintenance. This California sycamore, Plantanus racemosa, had an evaluation prior to starting construction of a subdivision. 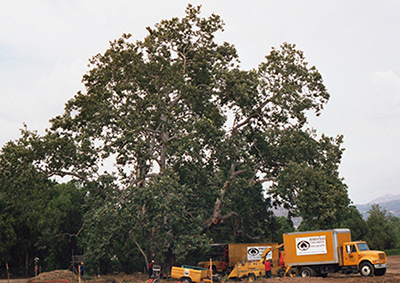 As a result of the evaluation, competing trees within the dripline were removed. 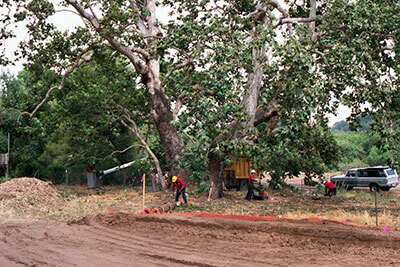 The area within the dripline was mulched and a construction fence ... largest California sycamore ... located in Poway ...was placed approximately five feet outside the dripline to protect the root zone during construction. This tree has since been successfully registered as the National co‑champion for the largest California sycamore. It is located in Poway, California. Call 619‑443‑1770 for an evaluation before it's too late!